Supervised mastertheses 2008-2015: Click here for an overview. 2015 Mater Sapientia: ‘Divine motherhood and spiritual motherhood in the work of St. Augustine. Supervision: prof. A.-M. Korte (Utrecht University) & prof. P.J.A. Nissen (Radboud University Nijmegen). Candidate: drs. K. Bouwman (external PhD candidate Utrecht University). PhD defence at Utrecht University, 4 June 2015. 2014 Religion, Secularity and Feminism in a West-European Context: A Qualitative Study of Organisations and Activism in Flanders. Supervision: prof. dr. C. Longman (Ghent University, Belgium), prof. dr. A.-M. Korte (Utrecht University) & prof. dr. M.A.C. de Haardt (Radboud University Nijmegen). Candidate: drs. 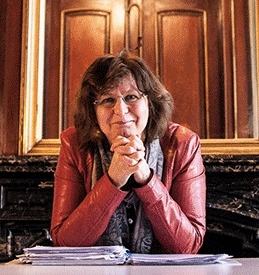 Nella van den Brandt (Ghent University). PhD defence at Ghent University, Belgium, 15 December 2014 . 2014 “Judging By Her”: Female Literary Characters As Embodiment of Israel. Supervision: prof. dr. B. Becking (Utrecht University) & prof. dr. A.-M. Korte (Utrecht University). Candidate: drs. A.-M. Wetter (Utrecht University). PhD defence at Utrecht University, 7 April 2014. 2013 Postcolonial Feminist Theology: Enacting Cultural, Religious, Gender, and Sexual Differences in Theological Reflection. Supervision: prof. dr. M.M. Jansen (Protestant Theological University) & prof. dr. A.-M. Korte (Utrecht University). Candidate: drs. W. de Jong (Protestant Theological University). PhD defence at the Protestant Theological University in Amsterdam, 10 December 2013. Supervision: prof. dr. P. Beentjes (Tilburg University) & prof. dr. A.-M. Korte (Utrecht University). Candidate: drs. A.-M. Bos (Faculty of Catholic Theology, Tilburg University). PhD defence at Faculty of Catholic Theology, Tilburg University, 30 March 2012. 2011 Body enhancement: Body images, vulnerability and moral responsibility. Supervision: prof. dr. A.-M. Korte (Utrecht University) & prof. dr. M. Düwell (Utrecht University). Candidate: drs. A. den Dikken (Utrecht University). PhD defence at Utrecht, Faculty of Humanities, Utrecht University, 10 June 2011. 2011 “The need for circumcised men”: The quest for transformed masculinities in African Christianity in the context of the HIV epidemic. Supervision: prof. dr. M. Frederiks (Utrecht University), prof. dr. A.-M. Korte (Utrecht University) & prof. dr. E. Chitando (University of Zimbabwe). Candidate: drs. A.S. van Klinken (Utrecht University). PhD defence at Utrecht, Faculty of Humanities, Utrecht University, 12 January 2011. 2007 Delila en de anderen: Een syntactisch georiënteerd bijbels-theologisch onderzoek naar de rol van de vrouwen in de Simson-cyclus (Richteren 13-16). Supervision: prof. dr. A.-M. Korte, prof. dr. K.A. Deurloo (UvA) & prof. dr. E. Talstra (VU University Amsterdam). Candidate: drs. W. van Wieringen (Catholic Theological University). PhD defence at Tilburg, Faculty of Catholic Theology, Tilburg University, 23 May 2007. 1996 A Momentary Taste of Being: Female Subjectivity, the Divine and the Science Fiction of James Tiptree jr. Supervision: prof. dr. R. Braidotti, prof. dr. A. van der Hoogen & prof. dr. A.-M. Korte. Candidate: drs. I. van der Spek (Faculty of Humanities, Utrecht University). PhD defence at Utrecht, Faculty of Humanities, Utrecht University, 23 February 1996.